(The 2nd intermission was spent outdoors, and checking-out the huge plasma). 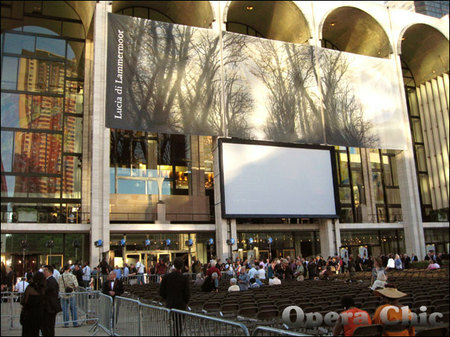 Okay, since a majority of you listened to the Lucia di Lammermoor simulcast via internet, and certainly a minority of you had been in attendance at either Times Square or Lincoln Center’s Josie Robertson Plaza yesterday night to catch the performance on the plasma screens, there won't be a play-by-play. You can go here instead for the excruciatingly delicious details, which OC reported during the September 20th Open Rehearsal. Now, here are the most exciting bits! 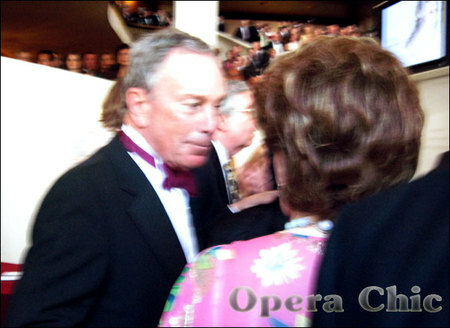 First of all, the last time OC went to the MET season opener a few years ago, there were like 12 paparazzi hanging-out front, and anyone could just walk up to Al Roker, Sarah Duchess of York, or Jamie Lynn Sigler as they appeared before the lobby, like all us ticket holders did. It was totally egalitarian and uncomplicated. Now the reception zone is wacktarded, with too many paparazzi lining the fenced-in red carpet that there are freaking risers erected so they can cram in two rows of the agency photo-snappers. 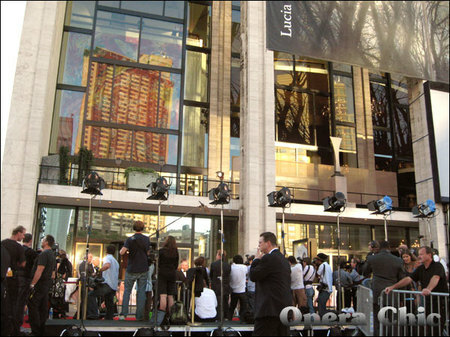 Plebeians are staunched at the entrance to Lincoln Center, where they congregate with digital cameras, Poland Springs, and the ubiquitous flip-flops. The downside is that the average photo buff can’t hang around the receiving area and take shots of NYC legacy, but the upside is that NYC legacy can’t get assaulted by roving stalkers. It’s win/win really. OC did the walk of fame into a packed lobby, a few moments before Bianca Jagger and Mercedes Bass, and almost ran into Mayor Bloomberg. O hay here are a few pics. So who did we see? <-- Definitely not Mercedes Bass. Too many heiresses and heirs, a handful of singers, and lots of NYC "celebrity". But who OC really was looking for was Chris Meloni, on/off appearance-gifter at select NYC events. No Melonis. :-< Seating was late, no one wanted to squash their Zac Posens into their damn seats, and in total, the performance, which was supposed to finish at 9:52pm, was over more like 10:30pm, with curtain call stretching almost another ten minutes. There were about half a dozen attendees in kilts. Yeah, kilts. I appreciate the effort, but the opera is not a costume party tia. Should I go in full Japanese geisha regalia for the next Madama Butterfly? Or dressed as a matador for the Carmen? Actually, that could be kinda hawt. Most women were dressed in killer gowns, gorgeous quaffs, and sumptuous clutches. Most men were in sleek tuxedo. OC ditched the originally planned, too-flamboyant Diane von Furstenberg gown (no, not a wrap...waaaay too casual) for a much simpler von Furstenberg black dress, and worked it well. NYC is as big on black as we are in Milan for an evening at La Scala (yah, here’s a tip for you future attendees at Scala: when in doubt, wear black; you’ll fit right in). And although our pal Rachel Zoe stresses how poorly black dress photographs on the red carpet, we did it anyway. Before the performance, Gelb came out in a black on black suit/shirt combo (tux was still at the cleaners?) and announced that the performance was dedicated to the late greats Pavarotti and Sills, and then requested a moment of silence, which was incredibly, truly silent. Then the orchestra played the Star Spangled Banner, and the entire audience sang along. That’s not a joke. Since there was a fair share of professional singers in the crowds, our version of the Star Spangled Banner sounded much better than the sing-a-longs at Yankee Stadium. Also: the MET Orchestra. Overall, there were quite a few changes made from the Thursday, September 20th rehearsal that were noticeable in tonight’s earlier performance. Most of all, everyone was just so much hammier. The acting, emoting, and blocking were so much more theatrical and intense than before witnessed. Everything was souped up, even the silent fringe actors like the sedative-administering doctor during the Act III, Scene I il dolce suono, and the busy-body wedding photographer during Act II, Scene II sextet, were suffused with a new hyper-narrative. Dessay was the most noticeable detractor from her prior performance, and Act III’s il dolce suono [mad scene] was off teh hook. There were also a few opportunities where things did not go as smoothly as they had previously. In Act I, Scene II, the Lucia/Alisa duet ‘ah, giorni d’amaro pianto’ was a prime example. Dessay was blocked to leap mid-aria from the rocks of the park onto the bare stage. In the rush of it all as she leapt, her ankle gave out, and she fell softly on her a$$, missing a few notes in the shock of omg omg I just bust a$$ while broadcasting in Times Square. Dessay, the consummate pro, covered it up well, only later accepting an outstretched arm from Michaela Marten’s Alisa at the end of the duet to help her off the floor. Dessay acknowledged instantly the accident, and as the applause filled the house (with loads and loads of encouraging, forgiving, understanding brave), she hung her head humbly to the side. She also referenced the slip in her grand, final curtain call, pretending she had a bad leg that fell from under her (more below). Another kink was during the very beginning of Act II, Scene I in Enrico’s apartment. As witnessed during the September 20 dress rehearsal, the transition to Scene II’s wedding banquet occured when servants came into the apartment and removed the drop-clothes from the furniture, and deconstructed the window shades. However, quickly into the first scene, one of the covered windows lost its shade, which tumbled unprovoked to the floor. Mariusz Kwiecien [Enrico] waltzed slowly over to the scene of the crime, regarded the fallen curtain with a slight shrug, and the audience giggled accordingly. It was pretty looooolllll. Later during the signing of the marriage contract [see here for a blow-by-blow of the debate], Zimmerman took the feedback proactively from Dessay, who was perplexed to as why the audience laughed at a very critical and disturbing part of drama ["It's not funny," "It's terrible!"] Instead of Enrico grabbing Lucia’s hand and signing the contract manipulating her, she indeed does it of her own volition, and hilarity thankfully, did not ensue. Aside from that, Dessay’s il dolce suono was magnificent, fragile, and terrifying. As much as I hated the narrative technique of the sedative-administering doctor, this time it worked, as Dessay held her recently-pricked arm and worked her way down into an exhaustive stupor before finally collapsing. She cut back on the maniacal laughter, and this time emitted an ear-shattering scream, like a trapped and bewildered animal, which sounded from the depths of a truly haunted woman. I don’t know what she’s channeling, but dang don’t stop, girl! Her applause afterwards was deafening and howling, lasting an indefinite parsec. One other noticeable concern was tenor Marcello Giordani’s suddenly failing voice during the final scene. His Tombe degli avi miei was breathtaking, with a premeditated, teasingly-slow pace. But by the time he got to Tu che a Dio spiegasti l’ali, his voice was weak, with a hard edge. There’s no doubt that he’s definitely in need of a few days off. Regardless, he rawked the entire first two acts, just as he had established himself as the indisputable star during the September 20th Open House. During final curtain call, Natalie lifted her skirt to show her boots, and mimed a comedic fall & slip, alluding to the earlier scene during Act I at the fountain of the Siren where she almost ate it…and then she made a bunch of other highly slapstick motions…[like that one you gave to passing truckers on school field trips to get them to blow their air horn]. I <3 this woman. Opera would be so freaking boring without her. Levine’s conducting was predictably excellent, but on the second listen, he still doesn’t get it. I will forever <3 the afro’d maestro, but his Lucia leaves OC with the knowledge that she’s heard one of the greatest living conductors, but not one of his finest interpretations. 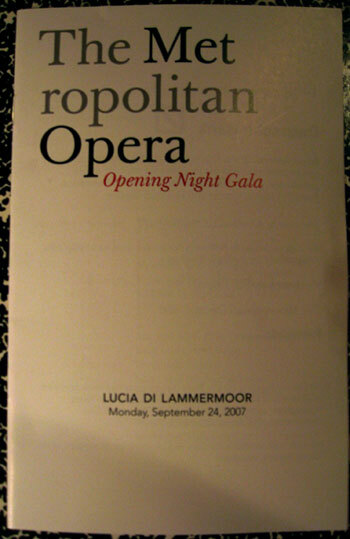 At the end of the entirely too-long evening, a Lucia that lasted four hours couldn’t possibly sustain the packaged hype that the MET machine churned-out for the past few months. Enjoyable and packed with talent, Zimmerman’s direction becomes a bit too ghoulish bordering on campy, starting and ending with zombie Lucia. We also didn’t like how many sets seemed wrought with detail and intricacies (like the Act I fountain of the Siren), while others (Act III Wolf’s Craig Castle) extraordinarily dull and careless. And the mad scene is kinda incongruous: I mean, a wooden staircase in a Scottish castle? Is it really that hard to get some fauxpierre up in here? 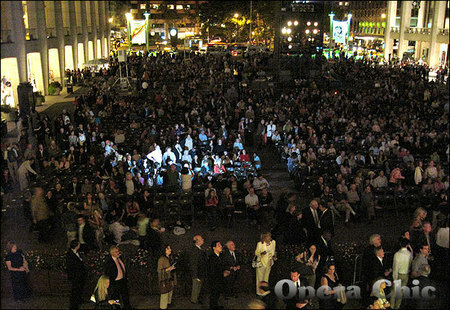 (Pavs singing Una furtiva lagrima on the big screen from out front of the Metropolitan Opera House. Intermission got boring, so we headed outside to view the jumbo-tron). 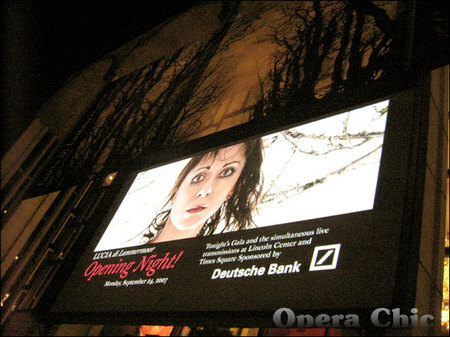 (Netrebko showing-off the goods on the big screen). 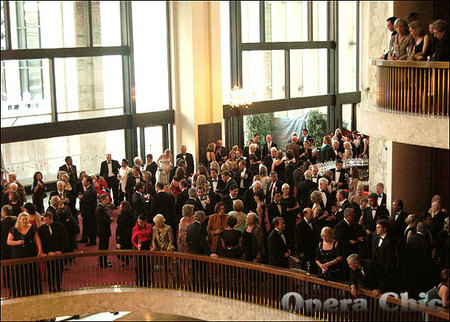 (This is what you guys looked like to us from the Grand Tier). Later today video will appear right here at OC blog of that additional curtain call on the Grand Tier, so check back l8r. I have received a deep, detailed and wonderful review of Lucia's performance written by Howard, one of the regular readers of the blog. I can only describe the Lucia at the Metropolitan Opera of Lucia as magical. Piotr Beczala as Edgardo was tentative at first but sang his heart out in the last act. Mariusz Kwiecien as Enrico was rich, solid and commanded a presence on the stage. Marco Armiliato held the audience captive with a finally tuned orchestra that never overpowered the singers. You could hear a pin drop in the third act. The addition of the glass harmonica merely added to the drama of a distraught Lucia. While this role, may have been somewhat a stretch for Netrebko as a coloratura soprano, she conquered the stage with drama, superlative acting and nothing short of highly colored voice with a gorgeous lower register. With the exception of one transposed note, she was dead on the brilliance of her higher register with commanding confidence. The drama and torture of Lucia was evident in her ripping her wedding veil. Ms. Netrebko has developed an uncanny and uncommon ability to sing laying down, on her side or not even facing audience with ability to project well. Her ability to control dynamics resembles that of Callas and other illustrious singers. Her gestures appeared realistic and symptomatic of a tortured woman. I suspect that some of the costumes made her look heavier than in real life. It is joy to see Netrebko return to her passionate singing, as she brings joy to many. The composite well-rounded cast supported each other. It was eminently obvious, that these singers needed little reliance on the prompter's guidance. The Polish tenor Beczala deserves much credit for being able to pull this off without much preparation. We are sure to see more of him as he is truly a rising star. It is unfortunate to comment that the Mexican tenor, Rolando Villazon, once on top of the world seems now to be haunted by his own demons and human shortcomings. Once you lose your confidence, it is hard to regain composure. Villazon and Netrebko surely had a unique onstage chemistry and have sung together in L'Elisir D'Amore, Traviata and La Boheme. One can only hope that he will come to grips with his frailties and move forward. It is clear that many stars are waiting to fill the void. 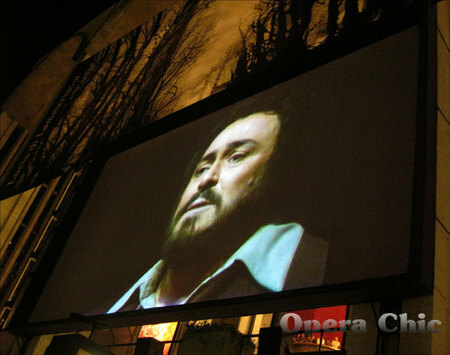 Anna Netrebko has shown the world that she can command the stage with many tenors e.g. Romeo and Juliet and now in Lucia, both in brief runs. For those who had the opportunity to see Lucia in person, one needs to solidify their memory via HD performances in theaters. The MET has announced that the will feature all 2009-10 HD performances on their Great Performances at the MET series on public television stations. While it is not fair to compare Dessay with Netrebko, it is eminently clear that both add much to the art giving much of themselves to the drama of a live performance. I loved both, but Netrebko's grace and innate beauty are in a league of their own. We are off to see her next in La Traviata in San Francisco. I wanted to see her and Elina Garanca in Capulets and Montague at ROH in London, but limited vacation and poor timing may preclude this trip. 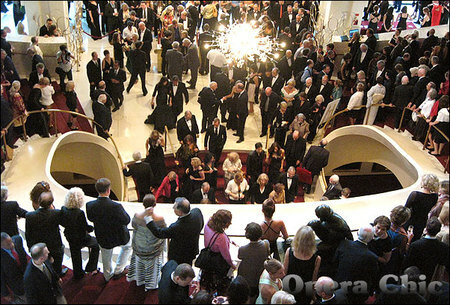 My wife and I truly enjoy opera and have traveled far and wide to hear and view great talent. We truly have a new generation of talented individuals and it appears that many are from Eastern Europe and Russia where there is still a premium on advanced discipline and vocal training. We all should encourage this type of forward thinking and hope that today's artists have long and industrious careers. It will be interesting to see how Erwin Schrott and Anna Netrebko juggle family vs. career paths.